All standard hockey rules apply with the exception or addition of our league rules below. We will not talk or discuss anything about your game until 24 hours after you game ends. Nothing gets accomplished in the Heat of the Moment. After the 24 hours is up, we will be open to talking about your issue, but not at the rink or right after your game. 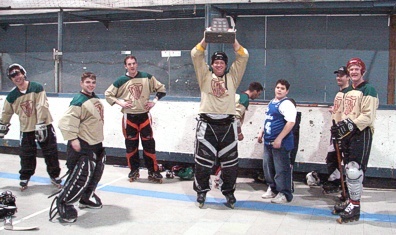 Icing has been removed from league play as of Oct 2007. Also, the ball will be played off the netting if it comes back into play. Dropping the gloves or a gloved punch to the face is considered a fight and an automatic game misconduct and possibly a suspension. If in the last 5 minutes of a game, an automatic minimum one game suspension is also assessed. 1. Hand passes are now allowed up to the center line. In other words, the hand pass must start and finish in your half of the court. This should speed up the game by allowing an extra 20 feet in the defensive zone to make a hand pass to a teammate. 2. Throwing your stick on the court or onto the bench, or smashing it anywhere on the court or boards in a violent manner will result in an automatic 2:00 penalty. 2nd offense 10 min misconduct. 3rd game misconduct. This should have been the rule all along, but now we are publically addressing this issue and taking matters out of the ref's hands by making it an automatic penalty. 3. Offside rule has been modified. The old rule was you couldn't make a direct pass to a teammate over the center line. The new rule is you cannot make a direct pass over THREE lines to a teammate. There is the center line and two white defensive zone lines on the court. The ONLY way a pass is offside is if you now pass from your defensive zone (behind your white line) all the way to a teammate who is in the attacking zone (opponent's white line). If it hits an opposing player, the ball is live no matter where the play starts and finishes. This should dramatically speed up the game and still put a restriction on extreme hanging. With this change there will be no more 4 foot offside passes. In order for a pass to be offside it will need to be a 30 foot pass and go over all 3 lines. Game clock stops in last two minute of game if the lead is two goals or less. On Saturday if tied, clock will stop at 30 seconds. Regulation play is 4 on 4 skaters and 1 goalie per team. One point for regulation tie. One more point for OT or shootout win. Each team has one timeout per game that must be called by the captain. Minor penalties are served at the player bench, 2 minute penalties, to start when the ball drops at the ensuing faceoff. In OT a maximum of one minute will be served or carried over for minor penalties. Mercy Rule: 17 goals scored by one team ends the game. (First team to 17) Unless otherwise specified before the game. The game may continue until the clock runs out, but the game is awarded to the team with 17 goals and no more stats are kept for that game. The clock will run after a whistle in a 2 goal game if there are under 10 seconds remaining, unless the faceoff is in defensive zone of the winning team. If a team does not have 3 of the rostered 9 skaters, it will considered a forfeit, though we will still play the game with subs. Kicking the ball in with your skate is LEGAL and a goal. The ball does NOT need to hit the ground on a faceoff if the official deems it a fair faceoff. You cannot put yourself offside on a play. You can legally grab the ball if you put it right down, if you make a move while holding the ball, the play may be blown dead. Hand passes are legal if they start and end in your own half of the court. The Scorekeeper is an official, and may discuss a play with the on ice officials. 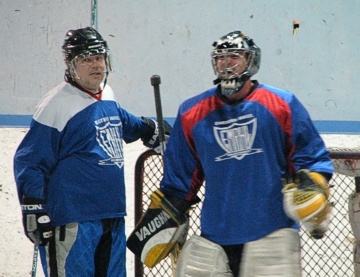 A player CAN be in the crease when a goal is scored, as long as in the opinion of the officials, the player did not interfere with the goaltender trying to make the save in any way. The game will continue if the goal is slightly displaced. If the goal has been displaced by more than a few inches, the ref can either stop play, or fix the net if play continues away from the displaced goal. If a goal is scored on the side that the post has been displaced, the referee can disallow that goal. Also if the goalie is fixing the post and a goal is scored, the referee can also disallow that goal. The official can drop the ball if a player is deliberately stalling to enter the face off. If you trip a player, even if you touch the ball first, it is still a minor penalty. Shooting the ball down the court after a goal will result in a warning, with a minor penalty handed out for all subsequent actions. Chinstraps are Mandatory. All players must have chinstraps fastened for EMRHL games. If your chinstrap is not fastened and your helmet comes off, it will be an automatic delay of game minor penalty. Crashing into the goalie while in or near his crease while he attempting to play goal will result in an automatic penalty to the charging player. If the player is pushed in by an opponent, no penalty will be enforced. Regular season Overtime will be played 3 on 3 for 3 minutes, with stop time in the final 30 seconds. Overtime penalties, maximum one minute for minor penalties. If a team gets two penalties in OT, we will play 4 on 2 if need be until one of the penalties expire, and reset back to a 3 on 3 format at the next stoppage. NO STOPPING THE CLOCK IN OT except in the final 30 seconds of play.